Recently, C.H. 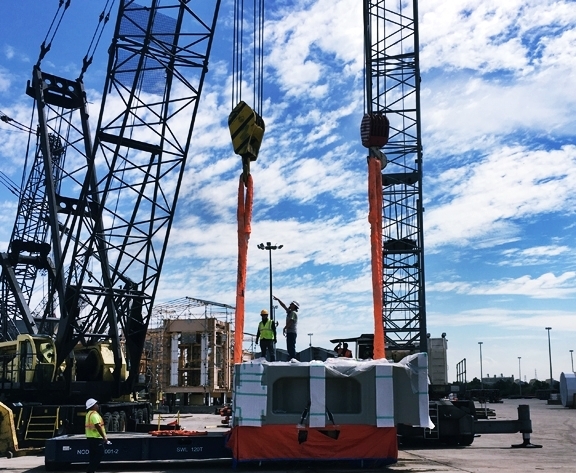 Robinson’s project logistics team worked with a company to ship components for the largest machine the client had ever been commissioned to build. The cargo consisted of two large molds, known as platens, which measured 5.3 x 5 x 1.6 meters, weighed 121 metric tons each, and were shipped from a supplier in Dalian, China, to a site in Holiday City, Ohio. Just before the first platen was to be picked up in Dalian, the C.H. Robinson team learned that the lifting slings would not be supplied. The team had to source those locally and get the test certificates shared before the platens could be lifted and placed onto the vessels for their two separate sailings ex-Shanghai to the Port of Houston, Texas. In Houston, the team utilized a 10 line Goldhofer trailer with both pull and push trucks attached for the inland portion of the journey. The original plan was to load the first platen and then truck to Ohio, then return for the second platen shipment’s arrival three weeks later. However, bank holiday traffic through Kansas and severe weather caused some delays on the first delivery and construction required that the cargo be rerouted. These delays prevented the return for the second platen in time to complete that shipment as a direct discharge from the ocean vessel to the truck. Instead, the team from C.H. Robinson arranged for the platen to be loaded onto a mafi trailer supplied by the stevedore, and placed in a storage location at the port. The trucking company freed up a second truck and 10 line Goldhofer trailer from a nearby job site and the second platen was transferred from the mafi trailer to the correct equipment for its journey to Ohio. The transfer was completed using two shore cranes and the truck reached its destination with fewer delays than the first delivery. When the platens arrived at the Port of Houston, it was noted that the tarping had torn during the ocean voyage. To ensure that the cargo was fully protected, the project logistics team arranged to have the pieces shrink wrapped at the port before the 1,200 mile journey to destination. Carpet remnants were placed between the platens and the chains, which were being used to secure the cargo to the trailers. This was to protect the platens from potential damage. Communication is key to any project, especially when delays are encountered. Throughout this project, the C.H. Robinson team worked very closely with the customer on the delivery schedule so all the relevant equipment was available onsite for the truck unloading. The second platen was more difficult to lift, since the securing/hook-on posts on that piece were slightly different from the first platen, causing a bit of an imbalance in length on one of the slings. Working with the ocean carrier, stevedore, and rigging company at destination, the team decided to use an extender to bridge the gap in the length.